Backing up your large vehicle is a cinch with the 9" Split Screen Monitor for up to 4 Backup Cameras. A crystal clear, full-color screen provides an extensive rear view for the ultimate in safe and secure driving. The split screen quad camera offers the option to view a single image or four separate images simultaneously. 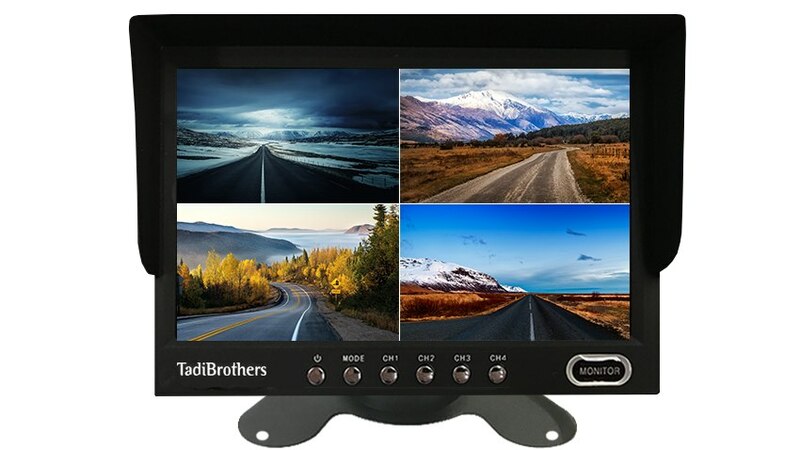 This versatile monitor is fully compatible with all Tadi Brothers cameras or monitors and will work in any car. Four video inputs allow you to connect up to 4 cameras, and change easily between cameras, a game system or a DVD player. Similar systems on the market block this feature, but at TadiBrothers, we want to offer the best flexibility to our customers. Super easy installation allows you to mount this slim, lightweight monitor on your dashboard with your choice of mounts, or attach it to the windshield with a powerful suction mount. All hardware is included. Connects readily to your cigarette lighter or any power source you choose. The set-up includes a 15 foot cable, which will work for an average SUV. We recommend upgrading to our premium extension cable, (located on the top left of the page), if you will be using an RV, bus, or other large vehicle. The package includes all cables needed to power up and get going. All cameras, monitors or car DVD players purchased from Tadi Brothers are fully compatible. Mix and match to create your own unique, first-rate electronic system for your vehicle! Ask us about our 4-8 cameras split screen options for security, buses, or RVs. At Tadi Brothers, we believe strongly in every item we sell, and we want you to have the best. With our 30 day guarantee, you can return any item for an exchange or full refund. Our 24/7 tech service is always here to answer any questions and provide you with superior customer satisfaction. 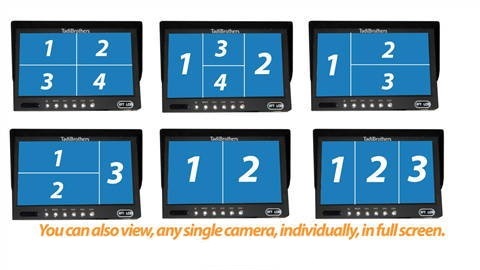 Order your 9" Split Screen Monitor for up to 4 Backup Cameras today!